Worlds Collide is upon us this weekend in Chicago with many great fights taking place. Fighters such as Jessie Vargas, Jarrell Miller, Tomasz Adamek, Daniel Roman, and Artur Betebiev are topping the bill. One of the other high profile fighters taking center stage is top female fighter Jessica McCaskill. Jessica McCaskill, 5-2, 3 KO’s, of Chicago, is a two-time Golden Gloves winner and a former world title challenger. McCaskill also holds a job as an investment banker, so she has brains and brawn to add to her resume. She has worked hard to get where she is at today and has a remarkable story as she was once homeless. 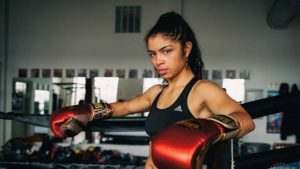 As a professional fighter, McCaskill has been fighting now for three years in the Lightweight division and worked her way to a title shot last year in only her 7th professional bout. She had challenged 2012 Olympic gold medal winner Katie Taylor over in London. McCaskill came up short in the fight and lost a unanimous decision, but gave the undefeated Taylor all she could handle. Due to this effort and her toughness, McCaskill has another opportunity at a title shot in her hometown of Chicago. McCaskill has now moved up to the Super Lightweight division and will challenge Argentina’s Erica Anabella Farias. Farias will be making her 5th defense of the WBC title against McCaskill. Farias will be another tough challenge for McCaskill as Farias brings world class experience. Farias brings a record of 26-2, with 10 KO’s and is looking to spoil the hometown crowd. However McCaskill has been training hard for this fight and will make the most of this opportunity. One thing is for sure, is she will have the crowd on her side and that will also serve as a motivation to get the victory on Saturday night.